As I've written before, my respect for Michael Barrier goes back to the late 1970s when he was publishing his magazine Funnyworld. The contents were an animation fan's dream: interviews, essays, illustrations and reviews all about cartoon animation of the golden age. There was never anything close to it before, and in the decades since there's been but one similar effort, Amid Amidi's excellent Animation Blast. It makes sense that given the huge interest in animation since the late 1980s at least one serious magazine about animation would exist now, but when Barrier was putting out Funnyworld it stood totally alone in a barren landscape of dry film journals who, if they deigned to discuss cartoons at all, usually reserved their attention for "serious", "artistic"(read: abstract, non-narrative) animation. They wouldn't have given the likes of Bob Clampett or Walt Disney the time of day unless it was as a dartboard for sexism/racism/facism/freudian subtext in cinema. Dull times indeed. From Funnyworld I gleaned that Barrier was a stickler for facts, interested in detail, and had formed very strong views about the various studios' output. His standards of what makes good or great animation were obviously high, but he knew enough about the techniques and context of studio animation to avoid a common stumbling block I've noticed--that of comparing apples to oranges, and finding apples lacking. That is, he appreciated the Warner Bros. best output just as much as he did the best of Disney's(you'd be hard pressed to find the same broad view taken by most of the veteran artists of that age). His last book, Hollywood Cartoons, was written with great weight given to the Disney studio--and considering the impact Disney's work had on how the world perceived animation of the so-called golden age, that made sense. 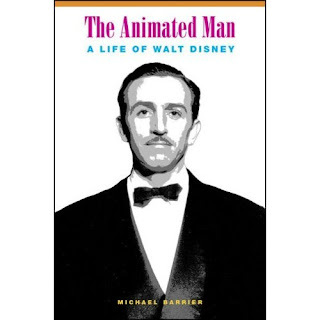 It also made me eager to read Barrier's take on a man he had heard so much about from so many of his closest colleagues and employees: Walt Disney. Since I write this blog as an animation artist and fan, and that's who I write it for, I'll put it this way: Animated Man is the book I've always wanted to read on Disney the person, and the one that I've enjoyed the most (of the two recently released and the previous few), because it's plain the author understands exactly how animated cartoons are and were made--what they are, what they can be, and how it felt to work for Walt Disney at that incredible time in history, for better or worse. Years of research and hundreds of hours of interviews with so many artists employed by Disney clearly did that for Barrier. Although he obviously finds Walt admirable and fascinating(which he inarguably was), he never deifies him or avoids describing--through first person interviews, letters, articles and quotes--the rough edges that made up a complicated, brilliant individual. I simply don't get that feeling--that tingling at the nape of the neck, if you will--from most other authors' attempts at portraying Disney that I got from this book: that I was getting a glimpse of the real person, as much as anyone at this far remove of time and commercial ossification ever could. A striking addition to this biography lacking in so many others is the number of long-forgotten articles in major magazines Barrier tracked down and quotes from. They're fascinating reading. Often they reveal startlingly frank descriptions of Walt's manner and appearance--much more so than one would think possible from, say, a McCalls magazine of the 1940s. It tears away the veil of reverence that's obscured the real man, resulting in Walt Disney being made over into "Uncle Walt"--a jovial, grandfatherly, completely unintimidating figure as mythical as any of his characters, if not more so. This phony Walt, well-meant as the image might be, is terribly unfair to a man whose contradictions and flaws were just as vital to his makeup and his success as were his boundless enthusiasms, entrepreneurial spirit and imagination. From Barrier we get neither a candy-coated view of Disney nor a fashionably po-mo slam; the context of the particular time is always clear, and made meaningful--not necessarily to Disney's benefit as an "icon", but always fair. One may occasionally wince at what one reads, but never does it ring false. Rather, it made me respect and appreciate the complete man even more--and really, really appreciate the difficulties of working for him on his greatest projects--and his failures. 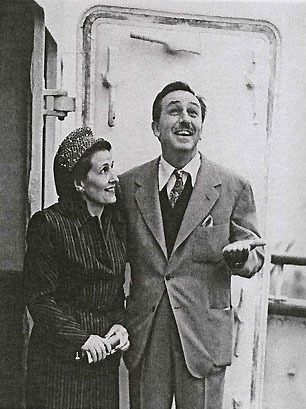 Since the sucess of the Disney studios depended so heavily on the contributions of many artists, we are treated to much fascinating information about those men and (few) women--including much more previously unpublished material than I expected to find. It's a biography of Walt Disney the individual, but it's also a great history of animated film production itself--since Disney virtually was his studio, as attached to it as Nemo was the Nautilus. Certainly some of Barrier's positions buck the mainstream--one example: he feels "Mary Poppins" is a deeply flawed film. Personally I fall more into the Leonard Maltin group; despite its length and miscasting I loved the movie, as I do the completely different Travers books. Same goes for "Jungle Book"--both the film and the great novels. But the fact is that every biographer had better have opinions, hopefully strong ones where his chosen subject is concerned. All I expect is that the author will express himself in such a way that I want to keep reading and feel I'm getting an honest context for a life--even if one or another of the author's stated opinions make me want to hurl the book across the room. Disagree though I might I never got to the hurling stage with Animated Man, and that's a tribute to the sagacity of the writing. As a kid I interviewed some animation veterans who'd worked closely with Walt. From some of them, particularly Ward Kimball and Art Babbitt, I got much more than I expected or could process at age 17 about just how ambivalent these men's emotions were towards their onetime boss. Their various contradictory views flummoxed me. Nothing in Bob Thomas prepared me for what they had to say, and I realized that I really had no idea of who Walt Disney was. If I'd been able to read The Animated Man beforehand it all would have made a lot more sense to me. I have to believe that The Animated Man is the definitive book on Walt Disney's life and work, and likely to remain so for quite a while. If you have more than an average interest in Disney or animation or film production as it was from the 1920s to the 60s, this will more than suit. It's a must-have. Addendum: I can't think of anything to strongly quibble with in the book save one(and it really is but a quibble, of limited import): I think Barrier somewhat missed the boat in his description of Calarts, the instituion that Disney personally planned from the ashes of the venerable Chouinard Art School that gave the studio so many of its artists. He describes the current campus as a "huge structure" when it's actually quite small, comprising a single building with no more then two floors of classrooms and space(I'm leaving out the notorious sublevel). Frankly the campus' five schools (film-dance-art-music-theatre) are if anything too crowded, as the building has never been substantially enlarged since its construction in the early '70s. And while Barrier points out that Walt's Calarts vision of a cross-pollinating melange didn't truly happen as he'd imagined, he doesn't mention the fact that at the very least, Calarts' music program is one of the most respected in the United States--and yes, we animation students were exposed to constant sounds of rehearsals, gamelan-jamming, jazz improvisation and dancers warming up in the shared hallways, and some cross-use between departments did occur. The theatre school too is extremely well-respected. And without the creation of the Character Animation department (as well as Jules Engel's slightly earlier Motion Graphics department) it's more than likely that any training at all of "Disney" animation wouldn't have happened outside the studio itself, or been available to any of the lone bunch of the era who still dreamed of feature animation performance and filmmaking--of creating "the illusion of life"--being a possible, viable career. Nevertheless, Barrier deserves credit for mentioning Calarts as being important to Walt at all as most writers on Disney completely ignore its importance in his life outside of the character animation classes' continuing additions to animation credits. Sounds wonderful! I have received my copy via Amazon...but I started re-reading Barrier's "Hollywood Cartoons" and want to finish it before I begin "The Animated Man". It was great to read your own review. That's a very good review, Jenny. I'm in the middle of the book (I'm reading it as slowly as I can since I'm enjoying it so much), but your review exactly describes the book I'm reading, and my feelings are so far very much the same. Thanks also for posting those caricatures in The Mousetrap. I just picked it up tonight at Barnes & Noble , and I'll dig in tomorrow afternoon. (I expect I'll be up all night reading it !) . Agree with your take on Mike Barrier : agree or disagre, love him or hate him, he's never boring to read and he knows his stuff . Paid his dues and we all owe him a debt for the interviews and research he's done. My Funnyworld magazines are amongst my most prized possessions. Michael-you're most welcome. My husband too is reading through it slowly-the better to enjoy it. I had to wrench it away from him to read it myself! I hope the book gets the attention it deserves--it's always such a pain for one book(or film come to that) to have to "follow" another--especially when it's been i the planning stages as long as this one has. Major P: excellent idea...I reread "Hollywwod Cartoons" too a while back; it's got so much detail that I felt like I was reading some of it for the first time. Thanks for the comments! Though many have tried and failed, Michael Barrier finally delivers the real Walt Disney. Finally, we have a book by an author with no agenda. Barrier's book was a delightful read, and I enjoyed every page. At last readers get to meet the same Walt Disney I met. I tried to respond to this a few days ago but Blogger ate my comment, as it very often seems to do! Thanks for the review. I had put of buying this book because of the slightly garish cover, not realising that it was written by Michael Barrier. I read the Bob Thomas book on Walt years ago and, while I enjoyed it, couldn't help feeling that it may have contained added sugar. Knowing that it was published by Disney probably didn't help the defence. It'll be great to be able to read yet another take on the now legendary man and look forward to reading it myself. I haven't read the book yet but I'm really looking forward to it. I saw Gabler talking about his own Disney book on TV and he didn't appear to be interested in the subject at all. I'll still read the Gabler book but hearing him made me all the more anxious to read Mike's. I've yet to pick up a copy -- reading your review, however, Jenny, makes me more antsy to buy it! Thanks for this great review! And Floyd, I'm bound to force you to start up a blog to tell us your stories of working at Disney and Pixar! Please, do us all a favor and do so! I love reading your marvellously erudite blog on a regular basis, Jenny. I'm having to make do with your review of Michael's book until Amazon UK get their stock in.